In a bowl, use a pastry cutter to chop up the eggs until small pieces. Stir in the yogurt, mayonnaise, capers, 2 teaspoons mustard, and chives. Season with salt and pepper, to taste. Add additional mustard if desired. 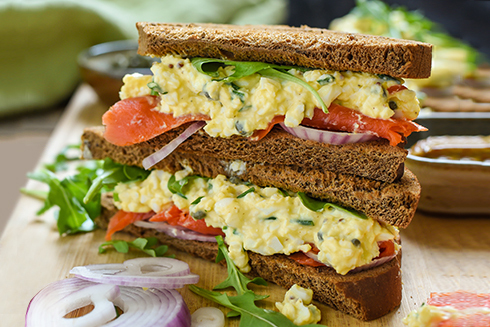 The egg salad can be served immediately, but tastes even better after being refrigerated for a few hours. To serve, place bread, red onion, arugula, tomato slices, and smoked salmon on a platter, along with extra capers and herbs, if desired. Allow guests to assemble the sandwiches to their taste, leaving them open face or making them into a regular sandwich. To hard boil the eggs, place the eggs in a single layer at the bottom of a large pot. Cover with a few inches of cold water. Cover the pot, turn the heat to high, and bring the water to a boil. Turn off the heat, leave the pot on the burner, and set a timer for 10 minutes. At the 10 minute mark, check one egg for doneness, leaving the lid on for the remaining eggs. If it's not quite done, leave them for an additional 2-3 minutes. I recommend using older eggs for hardboiled eggs as they peel much easier. To peel, crack the egg on a countertop then roll it under your palm to crack all over. Peel under a small stream of cold running water.